I crawled out of bed at midnight and unzipped the flap which served as the door to our large tent overlooking the Atlantic. Black clouds were rolling across the stars above and the wind roared raggedly up the dune. Walking barefoot in my pajamas I wound down the dark sandy trail that tunneled through the forest. I had seen crawls on the beach earlier that day and I just knew that one of those massive prehistoric reptiles could be heaving herself out of the sea right now. We were staying at the Sian Ka’an Biosphere Reserve on the Yucatan Peninsula of Mexico, in an eco-friendly lodge that shone no lights on the beach at night. That’s why sea turtles love to nest here. It had never occurred to us that we would see sea turtles on this journey. We just wound up in the right place at the right time: mid summer on a dark Mexican beach. I was carrying my headlamp, the one I had wrapped with red plastic from a corn chips bag to create a dim red glow. It is supposed to be hardly visible to turtles, but I didn’t want to take any chances. When I found the top of the steep stairs leading down to the beach, I switched it off. We made a simple red light out of our headlamp using a piece of a tortilla chip bag and a rubber band. My intention was only to sit on the bottom step and see what I could see. 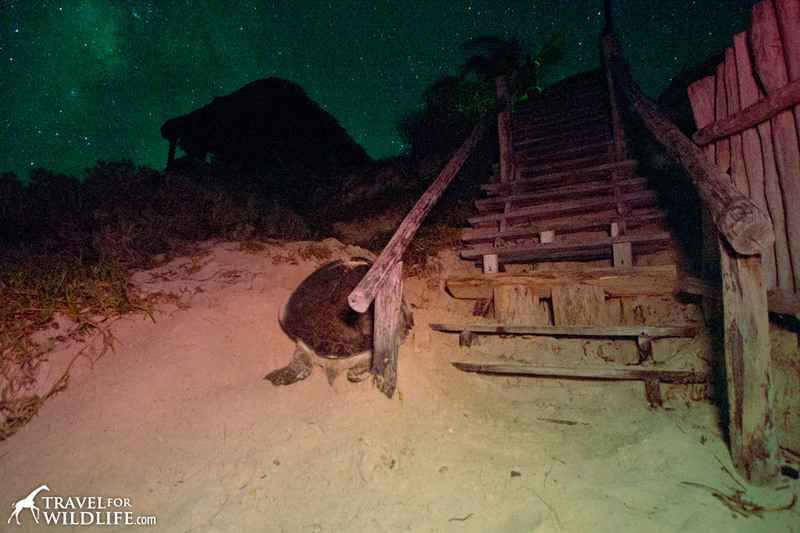 I knew that the movement of humans on the beach could cause a turtle to turn around and head back to sea so I resolved to stay by the steps. Nearly blind, I felt my way carefully down the wooden stairs that were almost as steep as a ladder. When I reached the last one and my toes struck sand, I felt something brush against my foot. After a moment of shock I realized that I had been touched by the very creature I had come to see. 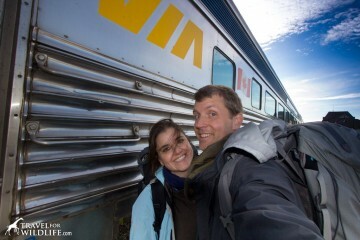 The odds of us arriving here at the same time were staggeringly small, but there we were. I looking for a nesting turtle, and she looking for a dune to nest in. I immediately froze and allowed her to move off the step and around the hand railing. As she continued her arduous climb up the dune, I slowly and quietly set up my camera on a tripod from behind her at the base of the steps. She was only a dark shadow heaving clumsily across lighter colored sand but I estimated my focus distance and opened the shutter for a 30 second exposure with the ISO set pretty high. Stars were still shining above the tent at the top of the dune but there certainly wouldn’t be enough light to expose the foreground. I set my headlamp to its dimmest setting, covered it completely with my other hand and turned it on. Then I raised it up into position, uncovered it for approximately one second, and covered it again until turning it off. During that second, while the scene was bathed in the dim red glow, I could see her now for the first time, bigger than a garbage can lid, pulling herself slowly upward with her long flippers. When she climbed about halfway up the dune, she began to dig. I repositioned on the stairs and opened another long exposure. During those 30 seconds, she threw sand at my lens and lightning flashed in the clouds over the sea. Again I uncovered for only one second to expose the foreground. Here is the image that resulted. 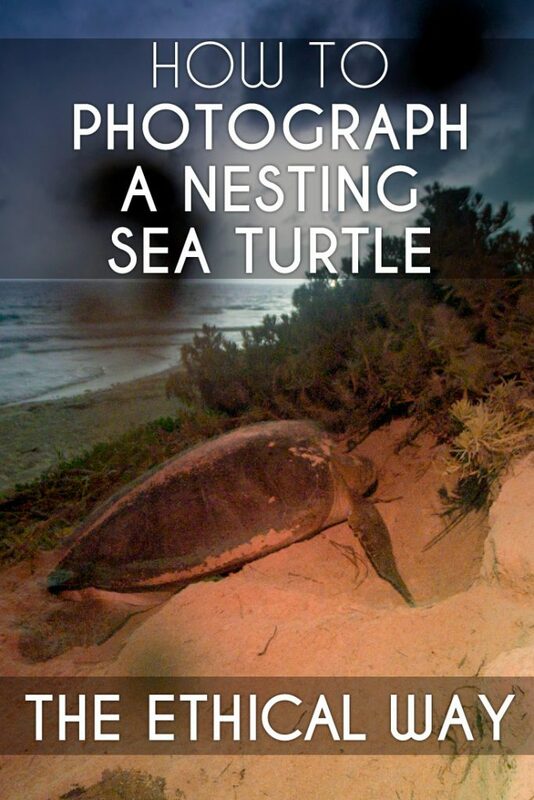 Should You Photograph Nesting Sea Turtles? Use a local guide if available. They understand turtle behavior and will also teach you about these amazing creatures. Keep disturbance to a minimum. 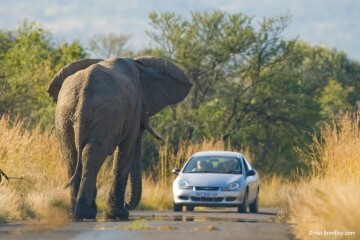 Move slowly and keep quiet. Never approach a sea turtle from the front, always do so from behind and keep low. Never approach a sea turtle as it arrives from the sea. They may feel threatened and return to the sea. Use your flashlight sparingly. Never shine your light in a sea turtle eyes. If you must use your flashlight use a red filter. Limit your viewing time to a few minutes. Some guides will allow you to photograph a turtle while it is laying eggs because they tend to go into a “trance” during this time. 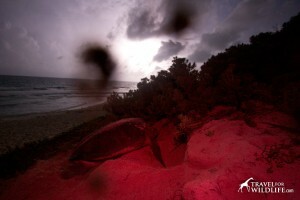 We recommend you never use a flash when photographing sea turtles, for the same reason you shouldn’t use flash lights. It may frighten a turtle back into the sea before she’s had a chance to lay her precious eggs or to bury them properly and protect them from predators. If like me you use a dim red light to expose the turtle for one second, then you’ll need to do some digital darkroom manipulation to get the colors right again. If you shoot raw, this is fairly easily accomplished using the white balance color sliders in the camera raw window of Photoshop. Slide the red/green slider toward the green and the yellow/blue slider a bit more toward the blue. It will probably be helpful to add some fill light as well and brighten the overall exposure. If you’re a more experienced Photoshop user, try adding a graduated filter to modify only the lower half of your image (the beach) so that you don’t throw off the colors in the sky too much. You can see my original and corrected images below. Sea turtle photo before processing. Sea turtle photo after processing. Nesting sea turtle photo after digital processing. Those of you who are anti-photo-manipulation should probably avoid photographing nesting sea turtles (unless you don’t mind red photos). 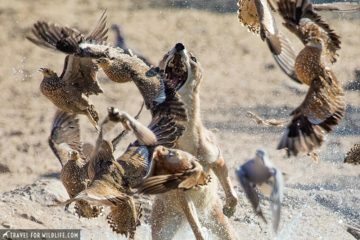 But for the rest of you, hopefully you will agree that these valuable tools offer you the chance to capture an incredible moment without jeopardizing the future of these endangered animals. 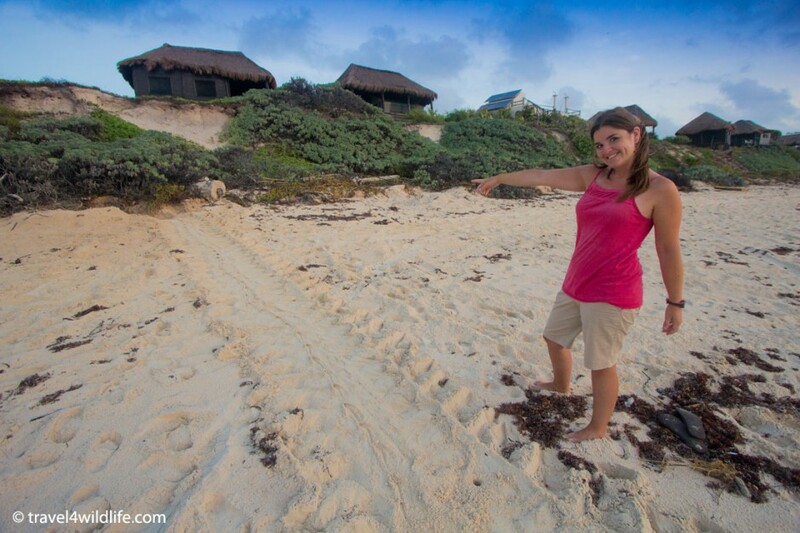 Sea turtles nest on beaches all around the world, but if you are an American like me, looking for a great nearby place to watch sea turtles, I highly recommend you stay at CESIAK in the Yucatan Peninsula of Mexico. When we were first planning our trip to Mexico all we had in mind was swimming with whale sharks and spotting jaguars in the Calakmul jungle. Between our two main destinations we stopped at the Sian Ka’an Biosphere Reserve so we could visit the dragons of Tulum and relax before heading into the jungle. The first morning at our Sian Ka’an beach hut brought a surprise. Right in front of our balcony was a turtle crawl, fresh tracks where a see turtle crawled up out of the sea to nest on the beach. We went down to the beach for a walk and discovered five more just in front of the hotel. 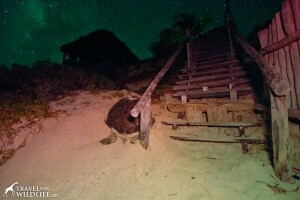 A fresh sea turtle crawl beneath our room in the Sian Ka’an Bisosphere Reserve, Mexico. We also found several sea turtle egg shell fragments, which meant there could be baby sea turtles around. 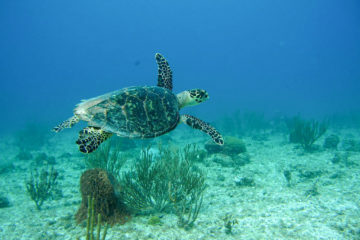 That same day we drove up the road to the bay of Akumal where we snorkeled with nearly a dozen different sea turtles. 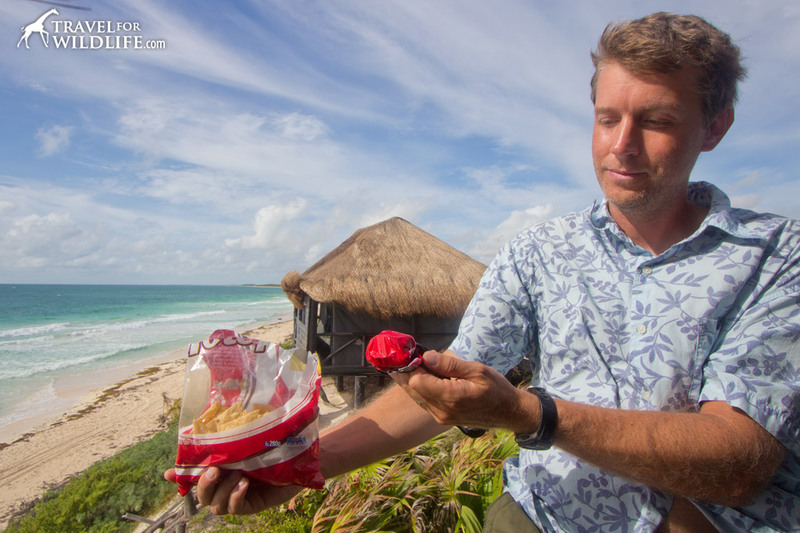 And after visiting Calakmul, we stopped again near Tulum and while walking the beach one evening we witnessed a nest of baby sea turtles hatching and heading out to sea. Remember to visit in the summer because that’s turtle nesting season! I’m so jealous of that bungalow for starters! Useful info! So cool you got to experience all this. Thanks Talon! 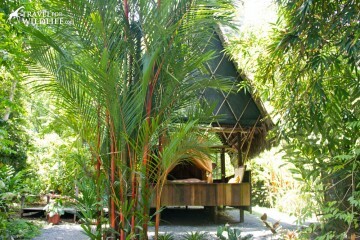 Those bungalow are really sweet, so peaceful and far away from the busy tourist places. Wow! Excellent post guys. Really very good information I hope to put to use one of these days. I love this HOW TO stuff you’re doing. Thanks Jim! I am so glad you are enjoying our How-to posts. If you go to Mexico you should stay on those bungalows. They have an awesome view! I have applied for a months volunteering at a turtle centre here in Turkey. I would love to get some photos of them but realise that if it ends up all about the experience instead, that is better than disturbing and upsetting them. Hi Nat. Very good philosophy. And I hope you get in with the turtle program in Turkey. That’s really great. Are you working with loggerheads there? When I volunteered with a program in Costa Rica I ended up not taking any photos either! 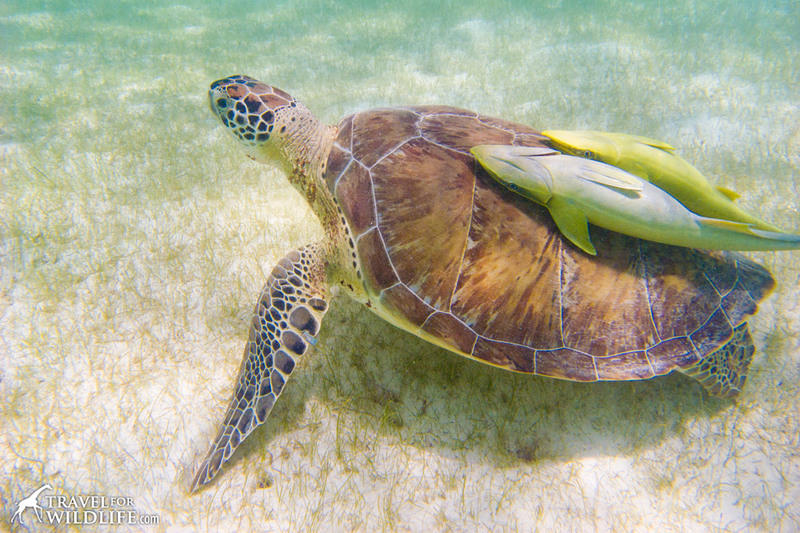 Wonderful story of a respectful and eco-conscious encounter with the majestic sea turtle. Wow, truly amazing! 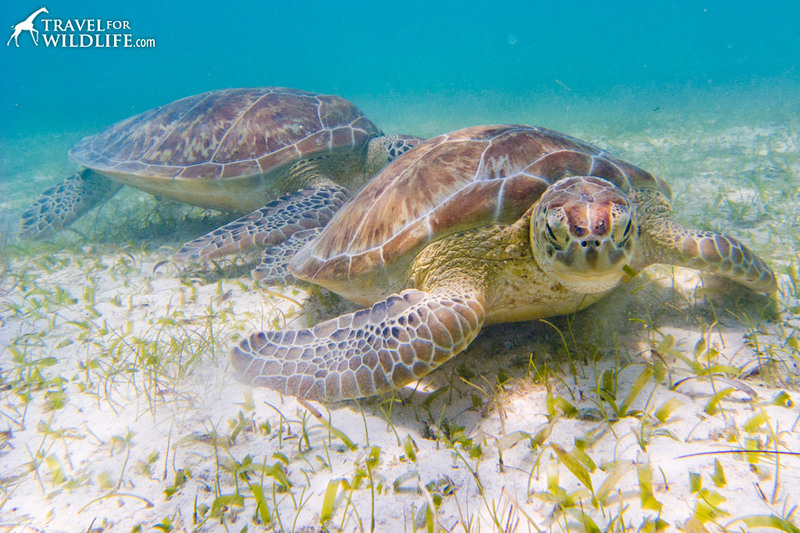 I am living in Playa del Carmen at the moment and have snorkeled at Akumal several times, but would LOVE to see turtles nesting this year. 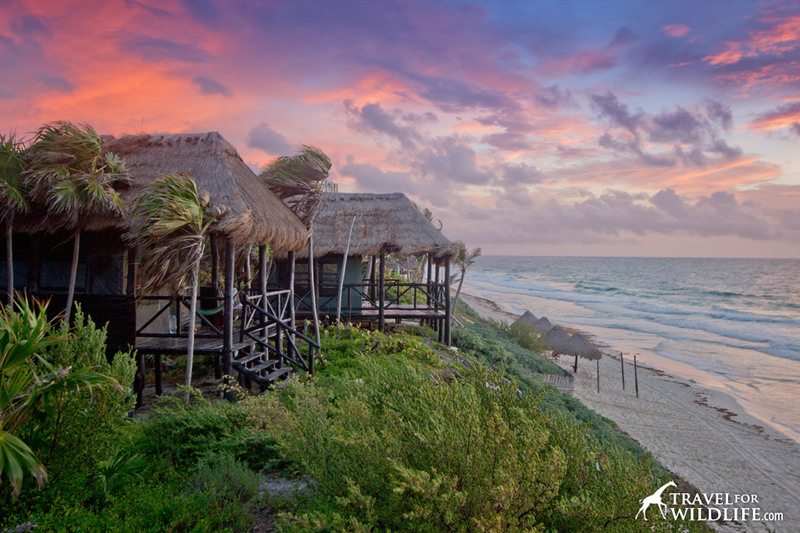 It looks like Sian Ka’an might be just the place. Thanks! I found this post doing a google search for how to safely and ethically photograph nesting turtles. As soon as I saw these photos in the google results, I thought “Sian Ka’an.” I stay at a house very close to CESiak when I visit Tulum, and this terrain and starry sky are undeniably Sian Ka’an. On my next visit I am determined to get some good nesting pictures, but do not want to disturb the turtles with a flash like others do. 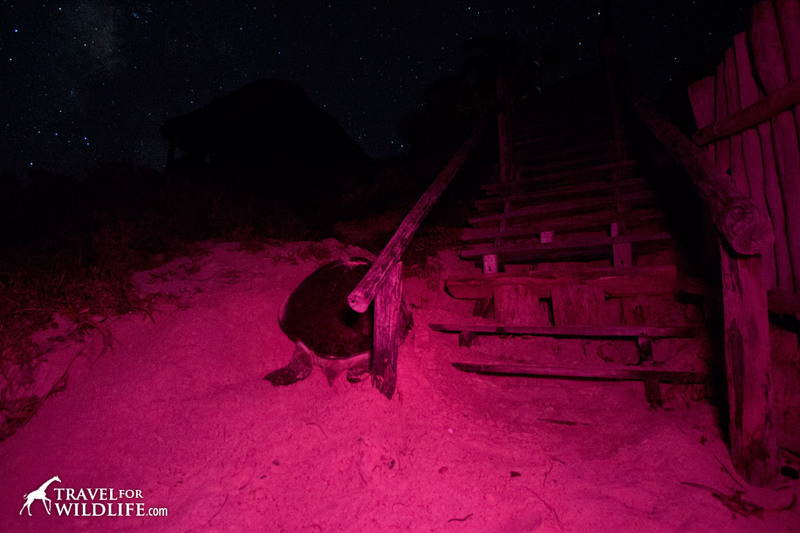 Your photos confirmed for me that the method I devised (a 30 second exposure with a brief red flash) should work to capture the amazing sky, while freezing all that crazy turtle nesting action. It’s so funny to me that you never considered that you would see turtles on your trip, and yet your photos are the best ethically taken images I have seen. You even captured the stars in the background. Well done and truly stunning! Thanks for reading and best of luck on your next visit to Sian Ka’an.